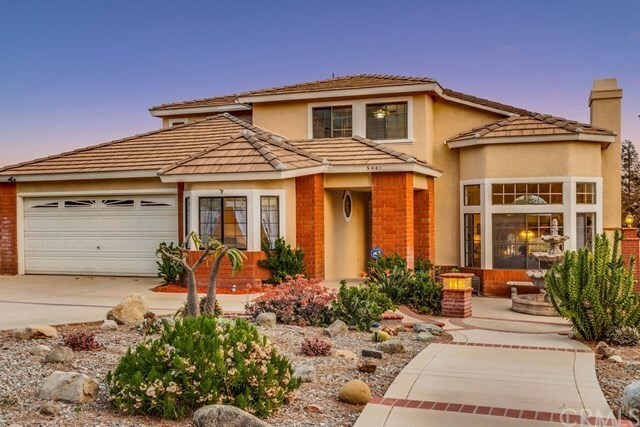 A bit of paradise awaits the discerning buyer in this North Alta Loma property. High up on the hill you will find this executive home tucked away on a quiet, tree-lined cul de sac. The front yard has been manicured with drought tolerant plants and provides great curb appeal as you approach this property. Enter to find and open and bright floorplan with lots of windows that let in an abundance of natural light. The living room & dining room are the perfect places to celebrate special occasions. The kitchen has been upgraded to include newer appliances & granite counters. Enjoy relaxing with family & friends in the spacious family room. Downstairs you will also find a fully contained guest quarters that includes a kitchenette, 3/4 bath and open living space. This is the perfect place for nanny or granny, with it's own separate entrance. It would also work ideally for a home office. Upstairs find the luxurious master suite with its romantic fireplace. The views from the deck are mesmerizing! The secondary rooms are also generously sized. Outdoors you will find an outstanding lot that offers a spectacular, sparkling pool, spa and outdoor entertaining area. Bring your RV, there is plenty of parking. There is tons of additional space for fun, family activities. You could also bring your horses! Ideally located well north of the 210 freeway on the west end of Alta Loma, it is commuter friendly. For those who are looking for not, just a home, but a lifestyle, look no further. Directions: From Sapphire, West on Hillside, North on Vinmar.